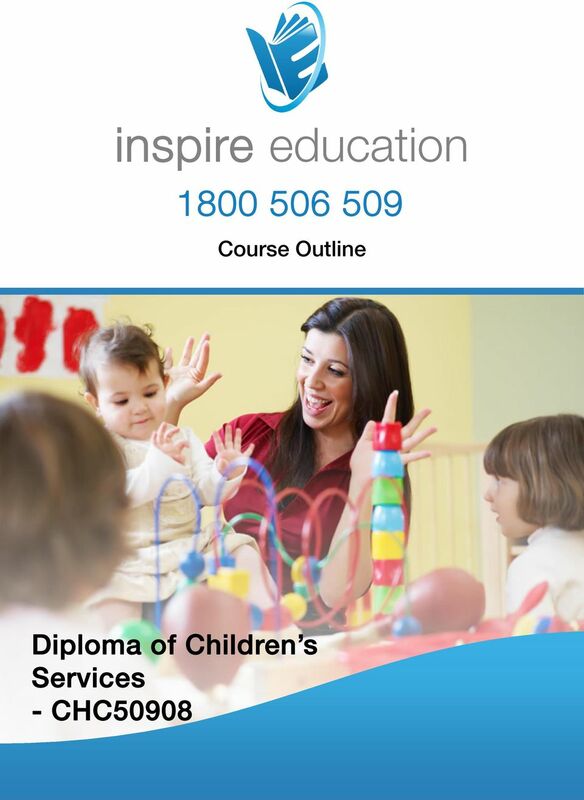 Download "inspire education Course Outline Diploma of Children s Services - CHC50908"
2 Take your Childcare Career to the Next Level with the Advance your Career in Childcare with the! Just imagine having a job that you love! The (Early Childhood Education and Care) is the next step in professional development for those seeking a fulfilling career in the childcare industry. 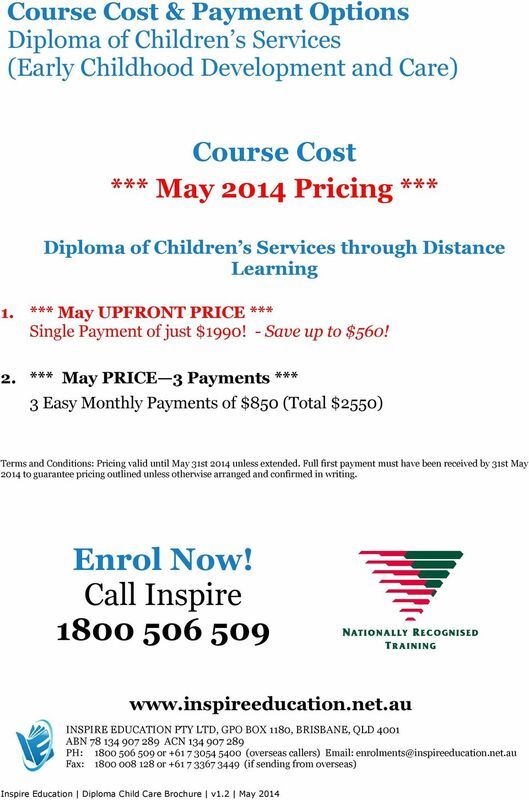 At the Diploma level, this course shifts to daily, weekly and long term programming in childcare. What Will you Learn? The offered by Inspire will give you an advanced understanding of many facets of early childhood education and care. Additionally, the is the minimum standard to manage a childcare service in Australia. 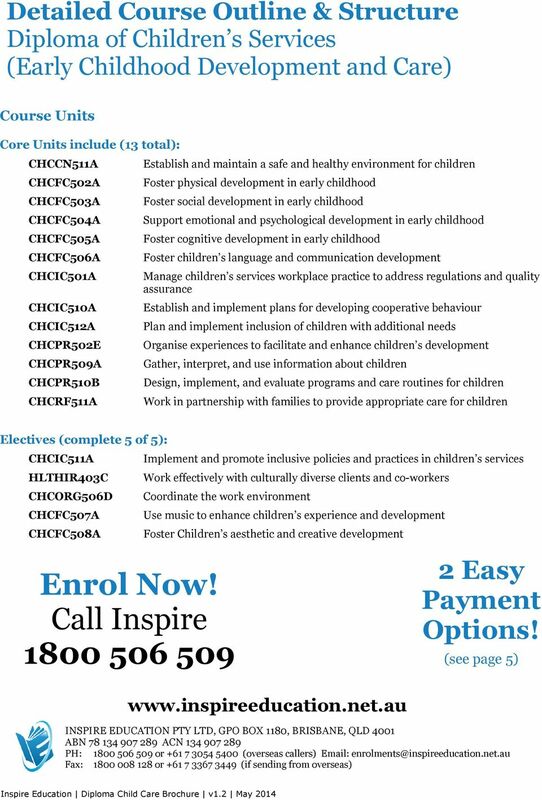 Typically, those undertaking this Diploma childcare course are seeking employment as a Group Leader, Lead Educator, Supervisor, Coordinator, Director, or Manager in a Childcare Centre, or work as a Child Development worker or Children s Services Manager. 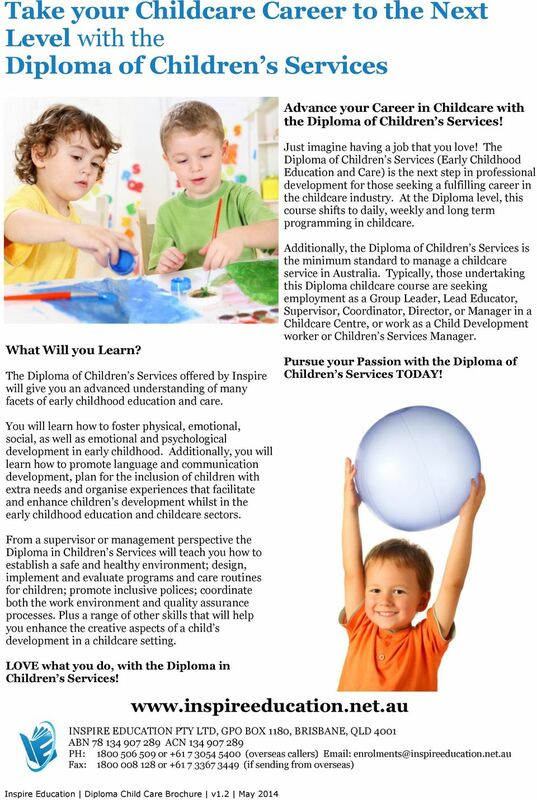 Pursue your Passion with the Diploma of Children s Services TODAY! You will learn how to foster physical, emotional, social, as well as emotional and psychological development in early childhood. Additionally, you will learn how to promote language and communication development, plan for the inclusion of children with extra needs and organise experiences that facilitate and enhance children s development whilst in the early childhood education and childcare sectors. From a supervisor or management perspective the Diploma in Children s Services will teach you how to establish a safe and healthy environment; design, implement and evaluate programs and care routines for children; promote inclusive polices; coordinate both the work environment and quality assurance processes. Plus a range of other skills that will help you enhance the creative aspects of a child s development in a childcare setting. LOVE what you do, with the Diploma in Children s Services! 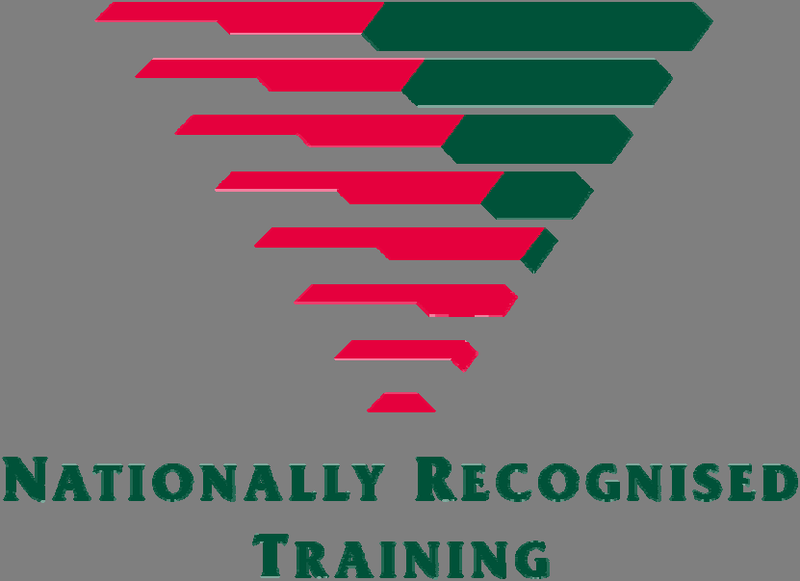 inspire education 1800 506 509 Course Outline Certificate IV in Business Administration BSB40507 Advance your Career with the Certificate IV in Business Administration Ready for a Rewarding Business Career? 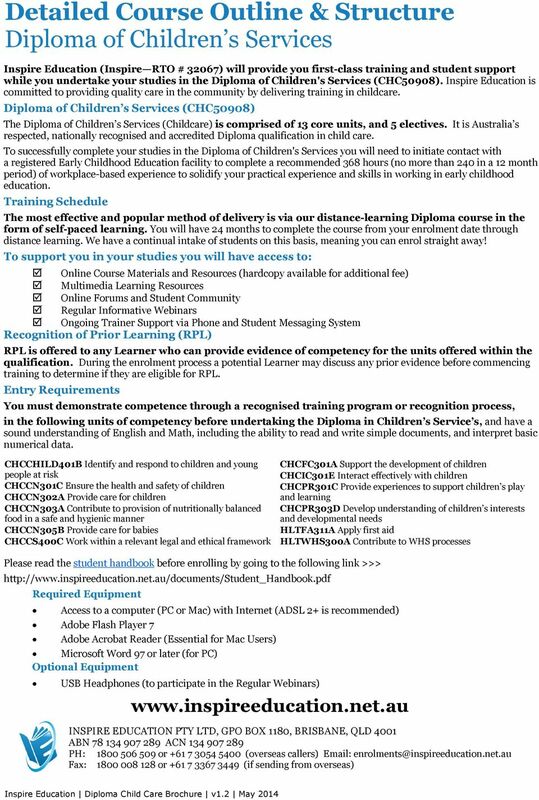 Fact Sheet Diploma Early Childhood Education and Care The CHC50113 Diploma of Early Childhood Education and Care is a nationally recognised qualification from the CHC Community Services Training Package.